“Ultrasound is the stethoscope for the 21st century,” says Dr. Doewe Kits, an emergency room physician in Brooks. “What ultrasound allows us to do is look inside and you can see exactly what’s going on. 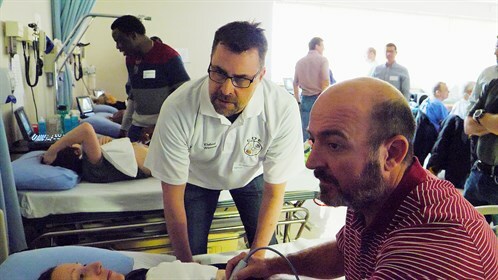 It’s a game changer,” adds Mark Bromley, course director for the EDE Point-of-Care Ultrasound Course. 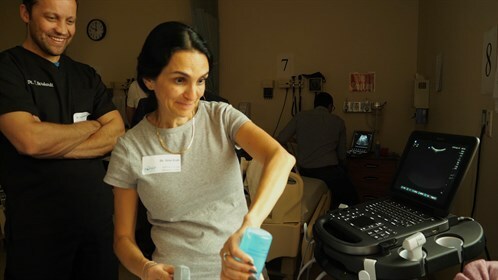 For rural physicians working in emergency, ultrasound is a skill that can greatly improve patient care. 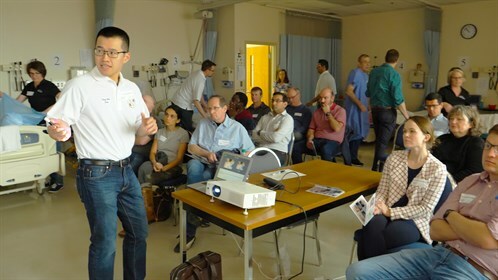 So, it’s no wonder that registration for the EDE Point-of-Care Ultrasound Course in Brooks filled up in just three days. Physicians saved both time and travel costs because it was being held right in their own backyard. Plus, financial support provided by RhPAP allowed them to attend at a discount rate. The 17 attending rural physicians came prepared. In advance, they read text and watched lectures online so that they could dedicate this day to hands-on training. The full-day course was held at the Brooks Campus of Medicine Hat College. Guiding them was a team of experts that included RhPAP Board Director Dr. Rob Warren. Take the scenario of a young person in a traffic accident. Is there internal bleeding? Young people can often look good until they suddenly crash. “Having the ability to quickly exclude life threatening problems or diagnose life threatening problems for us as physicians is very reassuring.” says Dr. Doewe Kits. Going forward, the physicians attending the course will have the opportunity to take advanced ultrasound training. And why not, ultrasound provides so much peace of mind for both patients and physicians.